I've been working for 3 weeks now on this girls schoolpicture. To be honest, it has been difficult I've put the picture aside a few times and hadn't figured out yet how to upload stuff to the forum and ask advice. Anyways.. this is the point where I am now.. I desperately need input or am I done?? I don't think you're done, but good for you to keep working at this - it's always slow going at first. I think there are a bunch of small things - details on the T shirt and collar, background around the arched top - that need attention, but the big thing is getting the face to look believable when there was so much damage to the original. Your version of the face is missing some of the shading that makes a 3D object look real on a piece of paper and in a couple of cases I think some shapes (eyes, mouth) aren't quite right. Take a look at some hints and a quickie edit I did to the face to show you what sort of thing to aim at. My version is not finished, but I think gets to a more believable face. I do think the jaw might be a little unusual with the lower jaw protruding, but it is hard to tell even looking at the blue and green channels. 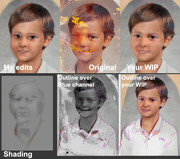 The shading layers over a gray background are separated to show you where things need to be lightened or darkened to round out the face and its features. The gray layer isn't part of the finished image. thank you Jo Ann Really needed a fresh look at the picture. I kinda felt a bit guilty that it took me so long to finish, but then I started over several times because I wasn't satisfied at all.. And you're so right about the mouth and eyes. I also noticed the logo on the shirt but had no clue what to make of it..
For the background.. thought the picture (partly oval) might be glued on cartboard before being framed? Or could it be one background? Never thought of sketching on the blue channel.. thank you!! ...Never thought of sketching on the blue channel.. thank you!! Just to be clear, I don't actually draw on the blue channel - it would make erasing and re-drawing a pain. Everything's on it's own layer and the view of the channels is done via a Channel Mixer adjustment layer - set it to Monochrome and then use 100% of whichever channel you want to see (and 0% for the others). You can control which layers are visible with Layer Comps to make it easier to switch views as you work. same here.. Always new layers for everything. Makes it so much easier to see what you've done.. These were tough ones. If it would help, you might ask the distributor about removing the frame and if there are any others of this little boy that might help you with his face. Good luck! thank you Shadow.. I've been working on the mouth again.. Think it's a bit better.. but still not done. It"s coming along. Maybe remove the remaining beige frame? This is another school pic of him a bit older that might help with the hair coloring. anyways, I can't get it any better than this.. I started over a few times because I couldn't see through all the layers anymore. I could change the bg to a completely greyish/blueish one without the cardboard, just with a white border. That's an option. What a tough picture, Wolly!! My hat's off to you for all your hard work! Yep. You sure put in the work on your little guy and brought him a long way. He's looking better! and my final.. I'm still not completely satisfied, but it is what it is..